Dive into all Major Aspects of Yoga & Learn to share yoga with others from a place of authenticity and compassion. Our aim is to provide a comprehensive and holistic Yoga Teacher Training experience that covers all the major aspects of yoga in both practice and in theory. Gain a thorough understanding into the science of yoga and cultivate a skillful and compassionate approach to sharing yoga with others. ROY's program focuses on the study, exploration and cultivation of universal principals and yoga techniques within a safe and supportive container that nurtures a healthy balance between self-enquiry and self acceptance. Students will learn how to apply these principals to teach across different class styles and levels. This is an inclusive approach that will enhance your own practice and wellbeing and guides you to share yoga with others from a place of relevance and suitability of the individuals that are in your care. Challenge yourself and immerse into a full intensive of lectures, workshops and yoga classes crafted together to enhance your learning experience. Refine your yoga practice with effective tools directly applicable on and off the mat and cultivate a loving and intimate relation to self. Learn to walk the fine line between ease and moving through challenge gracefully as you dedicate time towards devotion and nourishment of spirit. 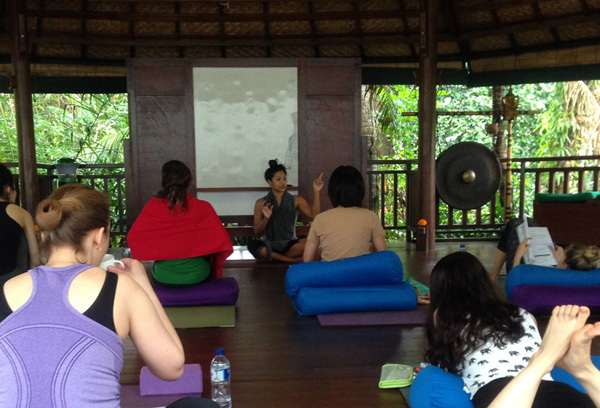 ROY’s Teacher Training programs are held in Ubud Bali, a destination choose for its supportive community and landscapes conducive to going within. Building an informed and appropriate approach to physical asana practice sets a solid foundation for the training program. In this segment, the main elements and qualities of a physical practice are explored. ﻿Lectures on Anatomy pave the way for Asana Workshops that focus in on asana groups, alignment principals and providing appropriate modifications and variations to suit individual scenarios. Concepts are applied in targeted yoga asana classes daily for integration and time is set aside for discussion and clarification on issues that arise during the day's explorations. The goal here is for the yoga practitioner to use the knowledge gained in the theoretical & hands-on workshops to build an inclusive and mindful approach to yoga asana that encourages its healing potential to surface within his or her own yoga practice as well as when teaching others. Beyond Asana & Subtle Anatomy modules provide a deeper view point for one's practice as well as a contemplative base from which to share yoga from. These topics cover the more subtle concepts and techniques of yoga, such as chakras, kriyas, mantras, yantras, pranayama and meditation. This goal of this segment is to move away from mystification and towards functional application. An experiential understanding of what is typically the more abstract realms of yoga is grounded into an appreciation of the validity and potency of these methods. Teaching Methodology, Sequencing and Teaching Labs offer the tools and guided training sessions to lead multi-level classes with clarity and confidence. 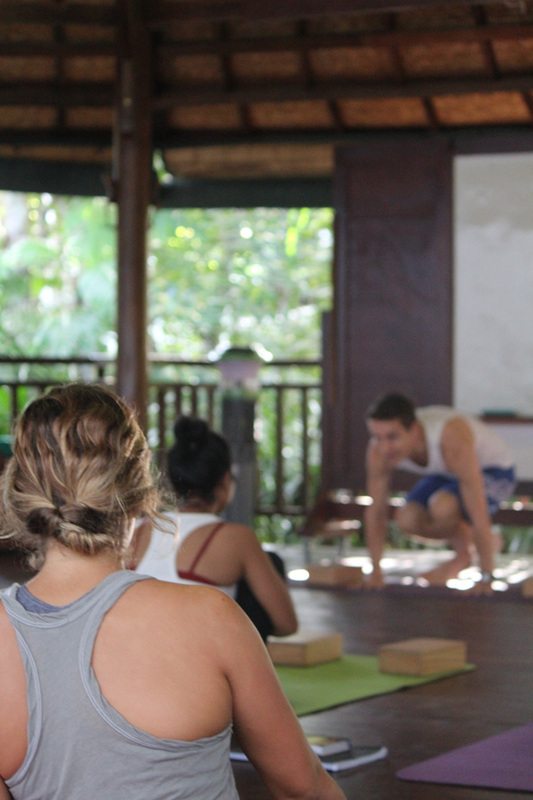 The topics covered in the first two areas of development teach students the core principals of yoga and how to implement them into their daily lives. Students gain confidence in their yoga practice and how it can positively impact their life and perception of the world. The Art of Teaching modules build onto this. While a comprehensive understanding of yoga and a regular practice are necessary pre-requisites for teaching, alone they do not ensure a clear and efficient transfer of information while sharing with others. The Art of Teaching subjects focus on developing key attributes in order to instructing a yoga class with nurturing each participant's particular teaching style and voice. Ample time is allocated to Teaching Labs for students to settle into the role of Instructor and gain hands-on experience teaching yoga. Gain insight into your yoga practice and start to respect your body's potentials and limitations. In Anatomy and Physiology lectures the body is explored progressively through its various systems. This includes learning about the anatomy of the body in relation to movement - the different types of joints and their range of movements, the muscles responsible for executing individual actions and the nerve system which co-ordinates them. Asana Workshops build upon this. Divided into the main asana categories, each workshop covers the in depth study of the key postures - their purpose, benefits, correct alignments, variations for all levels as well as the inter-relation between the asana groups. Comprehend how individual body parts work and how they co-relate and function together in unity - an understanding that will add new dimensions to an asana practice. Study the function and purpose behind the more subtle aspects and techniques of yoga and how to apply them to benefit an existing yoga practice. The ways to implement traditional yogic values into a modern lifestyle will be covered as well. The course introduces the history and the main philosophical concepts of yoga allowing participants to gain a thorough understanding of the science of yoga, illuminating new directions for the journey within. With daily asana practices as a fundament, the practice of pranayama (breathing techniques), meditation and mantra is added during this course. Through daily repetition and familiarity, participants will be able to continue a self-practice of these methods in a safe and effective manner after the completion of the program. Gain the tools and hands-on experience to start sharing yoga, refine your existing teaching skills and develop a safe and targeted practice for yourself. ﻿In Teaching Methodology the various ways to guide a class through one's body, voice and movement are covered as well as practicums on how to deliver proper verbal and physical alignments and adjustments. Sequencing classes cover the main principals of safe sequencing applicable across various styles of yoga. Students begin by learning a modular sequence that can be used as it is or modified to build safe and efficient classes suitable for all levels. Sample sequences will also be analysed. Students then progress to creating their own sequences based on specific intentions or themes. In Teaching Labs students start to teach and everyone will both give and receive feedback. This module is a great opportunity for students to test out their sequences across a variety of different body types and practice levels. A series of hands-on classes to practice teaching. Routes of Yoga's 200 hour Teacher Training program spans a 24 day period. This includes 3 Rest Days spread out during the course for periodic rest and recuperation during this intensive training program. Note : This timetable is exemplary. Variations to the schedule will occur depending on the specific venue of training and the particular topics on a given day and also to fully utilise the dynamics within individual teacher training groups. *Morning / Evening Practice refers to a yoga class which involves one or a combination of yoga techniques such as Asana / Pranayama / Mantra / Meditation.